Mill Lane Studio: Fabulous Jewelry from Findings is here! And Your Chance to Win a Copy. Fabulous Jewelry from Findings is here! And Your Chance to Win a Copy. I love it when unexpected deliveries arrive at my door! This week, I got a surprise delivery - one which made my day. I had hoped it might arrive before Christmas, but here we are in October and the advance copy of my new book "Fabulous Jewelry from Findings: Chic Designs using Spacers, Caps, Clasps, and More" arrived by courier, all the way from the US. This book has been three years in the making and to see it finally come to fruition is a dream come true. To say I'm excited would be an understatement! Fabulous Jewelry from Findings is a jewellery making book with a difference - there are no beads, no embellishments and no crystals. Instead, the projects in this book show you how to make chic and elegant jewellery using nothing but jewellery findings: where clasps become necklaces, bead caps become rings and spacers become bracelets. You'll do a double take as you realise what these jewellery pieces are made of! These innovative designs will have you looking at jewellery findings in a whole new light! But don't just take my word for it: read what Molly Fletcher from AllFreeJewelryMaking has to say about Fabulous Jewelry from Findings. And whilst you're there, you can enter the giveaway for your chance to win an advance copy of the book. 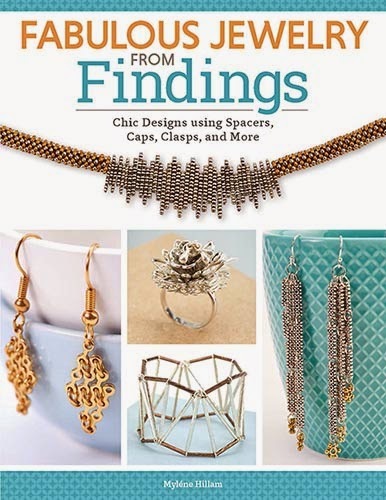 Fabulous Jewelry from Findings is scheduled for release on 1 December 2014 but you can get your copy now by clicking here and it will take you to Amazon. Or if you're in Australia, you can order from my website and get a signed copy. I hope you'll be inspired! Black Cat's Eye Pendant - Bewitching!